I was born in free India but grew up hearing stories of Partition, because my mother’s family had been compelled - like millions of others - to cross the border, when the dawn of freedom finally rose. What a blood-stained dawn it must have seemed; as freedom fighter Vijay Chauhan – who had with other women raised the tricolour inside the Lahore Women’s jail in 1942 – recalled, ‘hamara vatan chhoot gaya aur desh haat me mil gaya. Kya usko chaattein? (‘We lost our homeland and got a nation. Should we have licked it?’) She was seriously ill and dying when I recorded her testimony, so her choice of words can be excused and I was young and ‘if only the young knew and the old could’, as the saying goes. Then on December 6,1992, the Babri Masjid was demolished as the entire nation watched with horror the values of democracy and secularism our nation was built on being dismantled. We witnessed slogans, ‘Ek dhakka aur do, Babri masjid gira do’ – Give one more push, Babri Masjid should fall’ and while hundreds of kar sevaks jumped like orangutans with orange bandanas, the actual demolition could not have been done with pick-axes. There was much more than met the eye. As a young member of the Commission of Inquiry, set up by the Citizen’s Tribunal, we visited Ayodhya and Faizabad (now renamed) along with Kamla Prasad, Professor Kamal Chenoy, Professor Dinesh Mohan, Kirti Singh & Prof S. C Shukla in February 1993. We spoke to scores of people but there are a few meetings I wish to place on record today. I met a short-statured, stocky man who seemed to have a robust, fearless temperament - Baba Lal Das. He was appointed by the court as the official priest of the Ram Mandir. He said, ‘The things they seem to be fighting for they do not protect’. Rather mystified, I asked, what were they? He said, the original Ram Lalla was a different one, it disappeared during the demolition. I was dumb-struck. Baba Lal Das came and deposed in Delhi at the Constitution Club, before the Tribunal which was presided by retired High Court judges, Justice Tewatia, Justice O. Chinnappa Reddy and D.A. Desai. Baba Lal Das was later shot at and murdered in cold blood when he went for his morning ablutions. It was given out that he was killed over a property dispute but one wonders what property could it be but the preservation of some values over the Babri Masjid-Ram Janmbhoomi dispute? To kill Baba Lal Das was a horrific and shameless act and I wonder if his murderers have ever been brought to book? No one says don’t build the temple, but for god’s sake, does it have to be right there? Then in 1949 there was a surreptitious appearance of the Ram idol which was placed right there; is this then going to be the norm? Intelligence reports by the police recorded the desecration of Muslim graves December 1, 1992 onward and I remember meeting a leader of the Babri Masjid Action Committee who said he kept calling the then Prime Minister Narasimha Rao, but he did not take any action. Did Rao, being a wily tactician, think, let them destroy the mosque, let me build the temple? After all, it was Rajiv Gandhi’s government that allowed the ‘shilanyas puja’ there in 1989. Now the Bharatiya Janata Party-led government at the Centre has asked the Supreme Court to give the 67 acres of ‘superfluous’ land around it, but surely if the Court is hearing the title deed on the disputed land, this is like jumping the gun, ahead of the verdict, and is a superfluous argument. Ahead of the Lok Sabha elections, there is brouhaha over the mandir – ‘hum vahi banaenge’ – ‘we will build it right there’, but now the Vishwa Hindu Parishad has stated that it will give its propaganda a four-month hiatus, possibly with instructions from the BJP to enable it to get as many electoral allies on board. Build the temple, but don’t hurt the sentiments of 165 million Muslims. 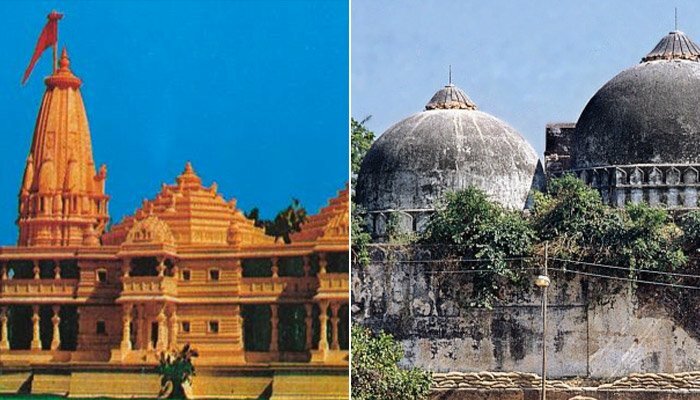 Build a temple and a mosque – let them co-exist cheek by jowl –just as Ayodhya and Faizabad have co-existed without communal tension which as everyone testified was ‘created by outsiders’. ‘We want to go back to our earlier peaceful life’, pleaded a woman to me in Ayodhya. As someone born in free India without the horrors of Partition, I ask you not to change the landscape of my country or the soft contours of the most tolerant religion – Hinduism - into something hard and fundamentalist. You do both Hinduism and India grave wrong and the next dawn could be a mottled one, awash with the bloodstains of your sins that even the Ganga will not wash off. Sagari Chhabra Is an award-winning author & film-maker. The views are personal.